Obviously I love fashion, but I will admit that after going to a million previews and market appointments, hosting ample desksides, and flipping through never-ending electronic lookbooks, it's rare that I get really excited about a brand. With that said, it was a morning like any other—until it wasn't. I woke up, checked my Google Calendar, and typed in the address for my first appointment of the day, which—you guessed it—was Markarian. I was familiar with the brand, but I had yet to see any of the pieces in person, so I was excited. I knocked on the door and was greeted by the brand’s designer, Alexandra O’Neill, herself, and ushered into the most adorable apartment I had ever been into in NYC. 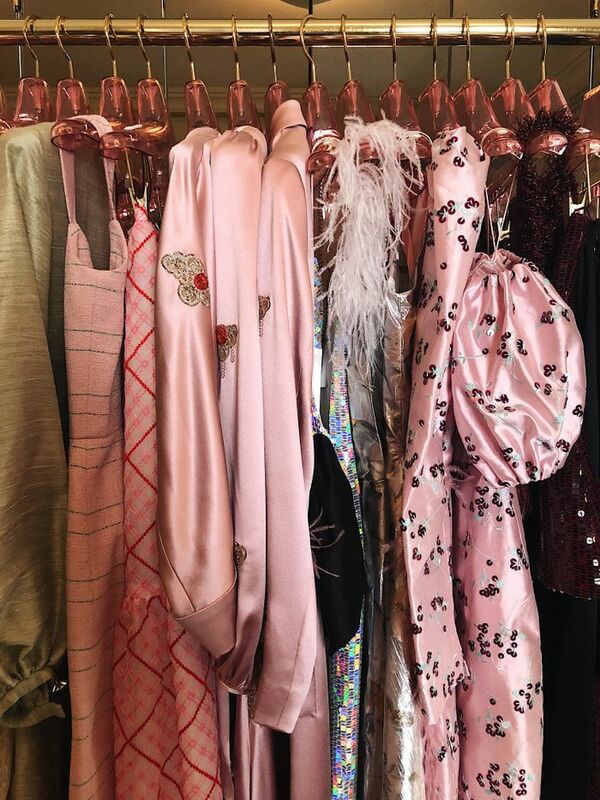 Alexandra began showing me the new collection after giving me the grand tour of her apartment once she saw how hard I was gushing over the place. As she flipped from one perfectly hung transparent hot-pink hanger to the next, my jaw dropped lower and lower to the ground. You might think I'm being dramatic, but one look at the pieces she brought into this world and you'll get it. Trust me. Everything that usually catches my eye during market appointments was not only present but took center stage. 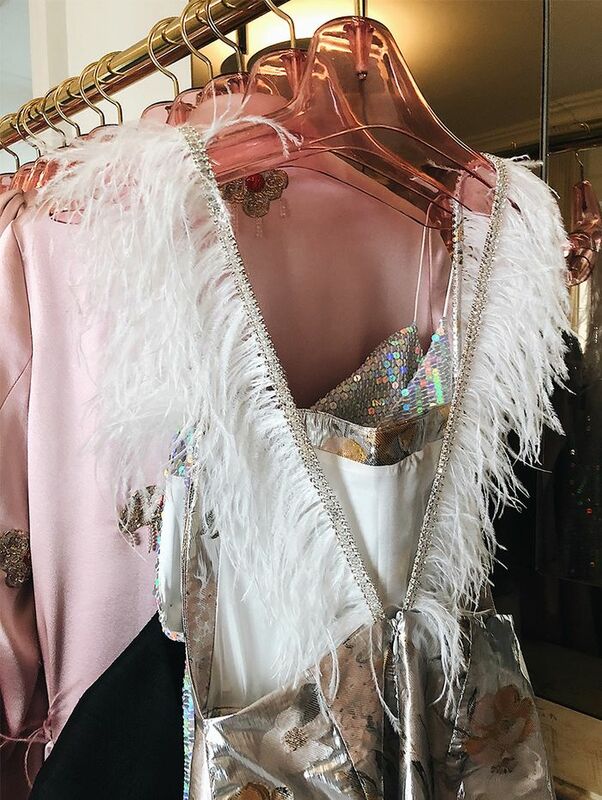 Feathers, sequins, bows, candy colors, and silhouettes unlike anything I'd seen before quickly melted my heart, and before I knew it, I was in love. Not only with Markarian, but fashion again. To ensure you have the same semi-spiritual experience I did, go on to read my full interview with Alexandra O'Neill, designer of Markarian, and to shop current pieces I'm loving from the brand. Tell me the story of how you became a designer. My grandmother GiGi taught me how to sew when I was younger, and I quickly fell in love with making clothing. I always knew I wanted to be a designer from that point. I would go to the fabric store in Denver and lay the fabric out on GiGi's floor, and she would help me put together whatever I wanted to make. She still helps me if I have any issues trying to figure out the construction of something. What did your friends and family say when you told them you wanted to become a designer? My friends and family have always been incredibly supportive, and they were not surprised when I told them I was starting a line. I'm so lucky to have such a strong network of support surrounding me. What was the initial inspiration behind your line? I was looking for clothing that was whimsical and playful, but also wearable and beautiful. I've always been drawn to all things celestial, so I launched Markarian combining all those interests. What were some of the major challenges when you first started out? I think one of the major challenges of a launching a company in any industry is providing something that's not already out there and keeping a strong, clear perspective. Luckily I knew exactly what it was that I wanted to do, and I've been able to maintain that focus. What are your major challenges now? Growing the company in a natural and organic way. What would you say sets Markarian apart from other eveningwear lines? There's a playfulness in the clothing that doesn't take itself too seriously; it also maintains a sophistication and ease. Describe the "Markarian girl" you typically design for. I design for my girlfriends, my mother, and my grandmother, even. The Markarian girl is looking for something beautifully made and timeless that reminds her of a special moment in her life. Any plans to branch out into wedding attire? I feel like your designs would so easily translate. I love working with brides, and I always have bridal in the back of my mind. I'd love to do a bridal capsule collection! I wake up early and immediately make myself a cappuccino while I answer emails from overseas. I then take some time to play with my puppies and garden on my terrace before the craziness of the day starts. I take fitting appointments and visit my factory in the Garment Center to see how orders and samples are going. I typically design and make adjustments to styles after everyone has left for the day when I can give it my full attention. Do you have any favorite interactions/stories with customers wearing your designs? I love getting pictures and thank-you emails from clients telling me how happy they were and how beautiful they felt in their Markarian piece!